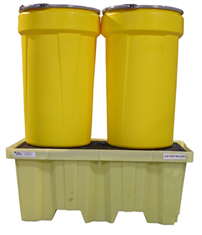 The ideal unit for indoor/outdoor storage of two or four 55 gallon drums. Drum storage a problem? 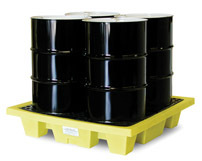 This Hard Cover and SpillPallet unit is ideal for indoor/outdoor storage of two or four 55 gallon drums. Roll-top design allows for use in limited space or next to buildings where swing-open doors would be a problem. Dual sided lockable door. Load from the front or back. 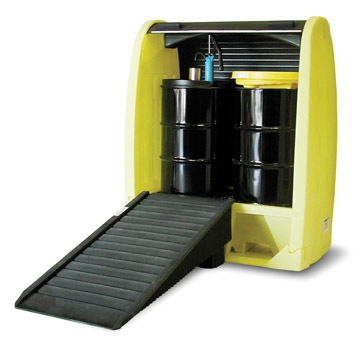 Allows ample room for drum pumps. Grates are removable for easy cleaning. 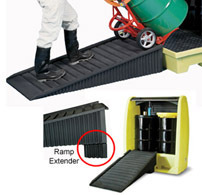 Easy drum loading and unloading with optional Ramp - shown in picture. 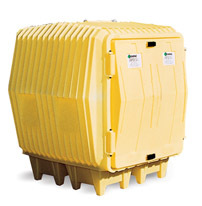 This item is oversized and must ship with a LTL freight company. Ships directly from the manufacturer.